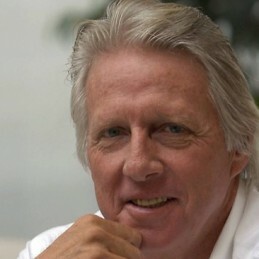 Best known simply as ‘Thommo’, Jeff Thomson made his Australian Test debut against Pakistan in 1973. He quickly developed a reputation as one of the fastest bowlers cricket has ever seen. With bowling partner Dennis Lillee, the pair became the most damaging and fear-invoking combinations of the era. In 1978, Thommo proved his standing as the faster bowler in the world by beating West Indian Michael Holding and Pakistani Imran Khan in the fastest bowling contest. West Indian legend Clive Lloyd stated that Thomson was the fastest bowler he’d ever seen. Thommo’s career highlight was the 1974/75 Ashes series where he took 33 wickets. He later caused controversy when he said “I enjoy hitting a batsman more than getting him out. I like to see blood on the pitch”. Thomson retired in 1985. With his strong persona and experience on the international stage, Thommo built his celebrity through professional coaching, motivational speaking and cricket commentary. His arsenal of cricket stories and anecdotes are unmatched.